Our first major donor and our first guests meet and celebrate! 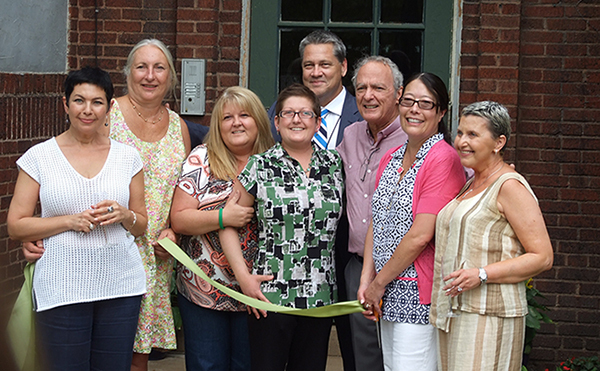 August 5, 2014 was an historic day for Transplant House of Cleveland! We honored Brian & Diane Vitale- our first major donors! Due to their past generous gifts and their new pledge of financial support, the Vitales names are now posted by the door of our first family suite, and they also adorn the outdoor entrance to the first quad of apartments. Brian, a New Jersey resident, received a liver transplant in Cleveland in late 2013, and learned of the critical need for affordable housing and supportive community for transplant patients and their families- and he and Diane wasted no time in making a charitable gift to Transplant House of Cleveland. “Without housing, some patients will choose not to travel for a transplant, and even one person making this type of decision is too many,” Brian said, in explaining their motivation for giving. “But we are just a piece of the puzzle,” Brian said at the ribbon-cutting ceremony to memorialize their giving and our “soft opening” of two apartment suites. He quickly acknowledged the many members of his “transplant family” who came out for the evening, and he then turned all of the attention to Ashley Foster and her mother, Miriam Bland- our very first guests! Ashley and Miriam effused gratefulness for the availability of housing right when they needed it! Ashley and Miriam travelled from Arizona for Ashley’s evaluation for a small intestine transplant. They are perfect first guests- giving valuable feedback about apartment furnishings and operational processes. Thank you, Diane and Brian, for your generous giving of your financial resources, and your tremendous energy toward the promotion of this mission (Brian continues to raise money back home!). Thank you, Ashley and Miriam, for trusting us and giving our home-away-from-home a try.